Captain Yuya Yanagi (Meiji) was awarded MVP, Evan Skoug (TCU) was presented with the "Fighting Spirit" award for his style of play and hustle and Jake Burger (Missouri State) earned batting title honors after hitting .353 (6-for-17) with three doubles over the course of the five-game set. 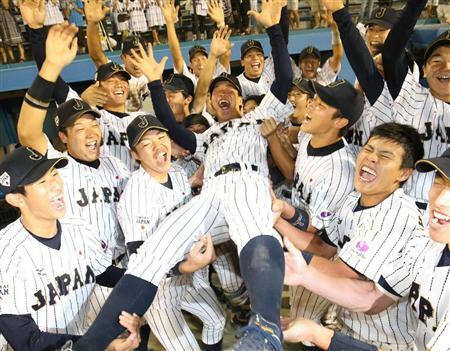 - In a dramatic conclusion to an extremely hard-fought and well-played series, a sacrifice fly in the bottom of the 10th inning lifted Japan to a 5-4 win and a series victory over the USA Baseball Collegiate National Team at Kusanagi Stadium on Sunday. The contest was the fourth game of the 40th USA-Japan International Collegiate Series to be decided by a single run with Team USA falling in three of those. With the score tied at 4-4 after nine innings, the bonus frame was played under international tiebreaker rules with runners placed on first and second and nobody out. In Team USA's turn at the plate, a sacrifice bunt moved both runners into scoring position but Japanese left-handed reliever Hiromasa Saito struck out the next two batters to keep the game tied. Japan followed with a sac bunt to open its half of the inning as well but Kairi Shimada was able to lift a 1-1 pitch to deep left to bring in the series-winning run. The U.S. squad had already had to fight its way back from a big deficit as Japan jumped out to a 4-0 advantage through the first five innings. For the second day in a row, however, Evan Skoug (TCU) gave Team USA a huge boost as he blasted a grand slam deep into the seats in right to tie the game up at 4-4 in the top of the sixth. In the ninth, the U.S. had an opportunity to take its first lead of the game with runners on the corners and just one out but a scorched line drive found its way into the glove of the Japan second baseman who then fired to first to double up the runner and end the threat. On the mound, Tanner Houck (Missouri) gave the U.S. four strong innings to start the contest, striking out a pair of batters. JB Bukauskas (North Carolina) worked the game's final 4.2 innings, yielding just the one unearned run on two hits while fanning three. Following the series, Skoug was presented with the "Fighting Spirit" award for his style of play and hustle and Jake Burger (Missouri State) earned batting title honors after hitting .353 (6-for-17) with three doubles over the course of the five-game set. "I was proud of our team. We fought very hard. We may not have played as clean of a game as we wanted to today but I respect how our team fought back to tie the game and had an opportunity to win the game in the ninth inning with a line drive as hard as you can hit a baseball. Their pitchers were very good, especially the top two guys that we saw again today (Yanagi and Sasaki). Their left-handed specialist (Saito) came in and pitched to the two guys who we wanted to be in the batter's box. Both of our guys went for it and unfortunately Saito got the best of them. On behalf of our team, we would take the opportunity to have Kendall and Skoug in the box against Saito every single time. Unfortunately that is the way athletics is. Sometimes you win and sometimes you don't." "My thought process was to just put a good swing on it and drive in a few runs. That is why Coach Horton put me in the three-hole today because I have been swinging a really hot bat. I just wanted to put a good swing on it and give my team a chance to get back into the game. Luckily enough I squared it up just right and it happened to go over the fence." "They are outstanding. They command their fastballs and their breaking balls and they pay attention to the details unlike any other pitchers I have seen. It is completely different than some of the college pitchers I am used to (facing). Not all the time is their stuff overpowering where they throw 98 miles per hour but they dissect you and pick you apart as a hitter. They find your weakness and they keep going for it. They mix speeds, mix tempos and are just very intelligent and very good." "I am very thankful, first off, to play for the United States of America and for Coach Horton giving me the opportunity to receive that batting title. It is great hitting in a lineup like this where you have guys one through nine that can drive the ball. It kind of takes the pressure off of you whereas in college you are the guy. The first few games weren't the best but these last few games we made some adjustments. Coach Horton and Coach Gill helped me through that. I am very thankful to receive the award."